Global Education Partnership (G.E.P.) is a dynamic network of educators, development professionals, business people, and visionaries working with low-income youth. G.E.P. 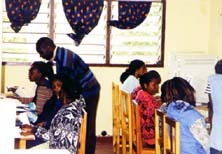 's international and U.S. affiliates operate community-based technology and business education centers in Kenya, Tanzania, Guatemala, Indonesia, and Oakland, California. According to United Nations estimates, youth between the ages of 15 and 24 account for more than one billion of the world�s population. Over the next decade, 700 million young people will enter the workforce. It is in the interest of society as a whole to ensure that this transition is successful and stable. This phenomenon represents an unprecedented opportunity to reduce poverty and build a foundation for economic self-sufficiency and prosperity. Global Education Partnership (G.E.P.) is well-positioned to help address the needs of young people in the underclass. Since 1995, G.E.P. has been devising programs and strategies that allow youth to define a personal vision, acquire essential business and information technology skills---and take action on behalf of themselves and their communities. Even when low-income youth have access to education, it often teaches neither the technical skills nor the entrepreneurial attitudes necessary for breaking the cycle of poverty. The need to provide youth with alternatives to traditional sources of education and employment is clear---as is the need to educate the whole person to become a productive, socially-conscious member of the community. Global Education Partnership (G.E.P.) is at the forefront of youth development, providing disadvantaged young people with a practical combination of learner-centered instruction, experiential skill-building, and economic opportunities. G.E.P. 's programs continue to distinguish themselves for their rigor, innovation, and effectiveness. Please click on the accompanying links to learn more about the organization's mission, history, programs, and accomplishments.